If you crave a more classic style of slot machine, then the Triple 7 Inferno slots should satisfy. Click here to play! A simple game of just three reels and one payline, the Triple 7 Inferno slots are easy to understand and they offer impressive top combination payouts for those who make the maximum bet. The Triple 7 Inferno slots are for the serious slots player who has gotten sick of the bright colors and bizarrely patterned paylines of many modern slots. It seems like most slots require you to put down a few dollars per spin to have any chance at winning the big prizes. Well, the Triple 7 Inferno slots are different, with a sensible theme based around the lucky number 7. Flaming 7s are the most valuable symbol, followed by red 7s, triple BAR symbols, double BAR symbols, BAR symbols and then blanks. Mixed 7s and mixed BARs also win prizes, but that's about as complex as the Triple 7 Inferno slots get. 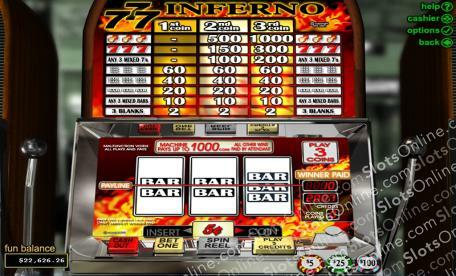 To start having simple slots fun, without the bells and whistles that so many modern slots use to get attention, take a crack at the Triple 7 Inferno slots.